Copyright Andrea Goutier – Love, Hestia – 2008.
can substitute any other bulky/superbulky slubby yarn, but it won’t be as awesome. now run off and scare your neighbors. Copyright lovehestia, Andrea Goutier 2008. For private, non-commercial use only. decreases. The suggested 5″ will give you a med-large size. Cast on 81 sts in the knitted on cast on method. For a stretchy brim cast on using the long tail method. 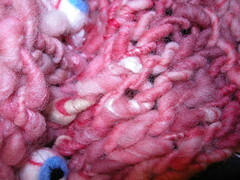 Join in the round, knitting first and last stitch together to eliminate jag. Total 80sts. Body: Work in K9, P1 for 5” inches. – Do not worry about how many rounds you are working. Simply work until knitting measures 5″ from end of ribbing (total of 6.5″ from cast on edge). 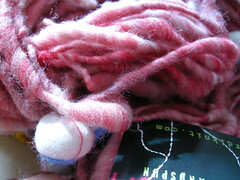 Break yarn and run through remaining stitches. Pull tight and secure. Weave in all ends. 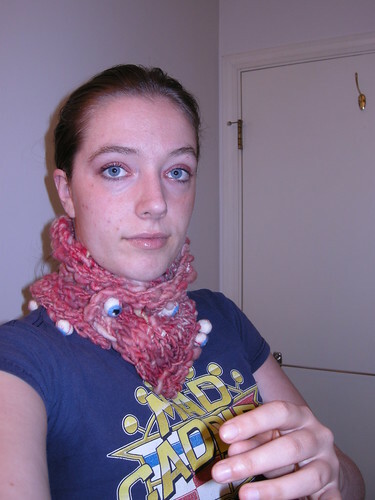 Please note: This pattern was originally available on my now defunct blog sunshineknits. this is my new home.